February 9, 2010 – Lockheed Martin Corporation and Kaman Aerospace Corporation successfully demonstrated to the U.S. Marine Corps the capability of the Unmanned K-MAX helicopter to resupply troops by unmanned helicopter at forward operating bases in Afghanistan. During a series of flights last week in subfreezing temperatures at the U.S. Army’s Dugway Proving Ground, UT, the Unmanned K-MAX demonstrated autonomous and remote control flight over both line-of-sight and satellite-based beyond line-of-sight data link. Performance attributes demonstrated included hovering at 12,000 ft. with a 1,500-pound sling load; delivering 3,000 pounds of cargo well within the six-hour required timeframe to a forward operating base (two 150 nm round-trip flights); remotely controlling flight and a precision load delivery by a ground-based operator in both day and night conditions; and uploading a new mission plan to the aircraft’s mission management system during flight. As an optional demonstration, Team K-MAX showcased the Unmanned K-MAX helicopter’s four-hook carousel, which enables multi-load deliveries in a single flight. Lifting a total cargo of 3,450 pounds, the aircraft flew to three pre-programmed delivery coordinates, autonomously releasing a sling load at each location. At the customer’s request, the fourth load delivery was performed under manual control by the ground operator. 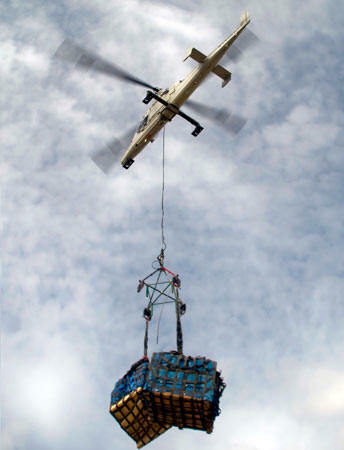 “The Unmanned System performed operationally representative cargo resupply scenarios, and each time the system delivered as promised,” said Sal Bordonaro, President, Kaman Helicopters, a division of Kaman Aerospace Corporation. “This capability gives the Marine Corps a proven unmanned power lifter to bring vital cargo to troops on the battlefield without the need for ground vehicles and manned helicopters.” Team K-MAX has flown the Unmanned K-MAX nearly 400 hours in unmanned mode since 2007. The demonstration fulfilled an $860,000 U.S. Marine Corps contract awarded to K-MAX manufacturer Kaman Aerospace in August 2009. A manned version of K-MAX has accumulated more than 250,000 flight hours, conducting repetitive lift operations for the construction and logging industries worldwide. Kaman Corporation, founded in 1945 by aviation pioneer Charles H. Kaman, and headquartered in Bloomfield, Connecticut conducts business in the aerospace and industrial distribution markets. The company produces and/or markets widely used proprietary aircraft bearings and components; complex metallic and composite aerostructures for commercial, military and general aviation fixed and rotary wing aircraft; staffing and arming solutions for missile and bomb systems for the U.S. and allied militaries; subcontract helicopter work; and support for the company’s SH-2G Super Seasprite maritime helicopters and K-MAX medium-to-heavy lift helicopters. The company is also a leading distributor of industrial parts, and operates nearly 200 customer service centers and five distribution centers across North America.